*Reminder you can only use one credit at Tiny Miss Eastern America. All age division and highpoint Queens will be determined by combining the scores from the mandatory events. INTERVIEW SCORE WILL BE OUT OF 10 POINTS FROM EACH JUDGE FOR AGES BABY-PETITE on stage events will be out of 100 points from each judge. This is to help younger contestants who have never participated in interview ease into it! Preteen-Elegant all events 100 points from each judge. All Queens will win a beautiful round crown, banner along with fees listed above, two runner-ups in each age division will receive an award, all contestants will receive a Gift. Awards for highest interview/gown/fitness will be awarded in each age group. WEE BABY(6-23mths) GOWN ONLY-$45 Contestants in Wee Baby will wear a short pageant dress/baby doll dress. Please wear white shoes and white socks. Gowns should be age appropriate and flattering to the contestant. Gown should fit well and not take away from the beauty of the contestant. Photogenic picture is included in this price, it is optional, photos will not be scored, judges mutual pick. GOWN: Contestants in Baby-Petite may wear a long or short gown. Contestants in Preteen and up will wear a long gown. If wearing a short gown please wear white shoes and white socks. Gowns should be age appropriate and flattering to the contestant. Gown should fit well and not take away from the beauty of the contestant. FITNESSWEAR: Contestants will model a fitness outfit consisting of top & shorts, bike shorts or fitness capris/leggings and tennis shoes of your choice. No props, cover ups hats or sunglasses. Rhinestones & sequins are acceptable if tastefully done. Please select the style that is most flattering to your body type. No bare midriffs in Baby-Preteen. INTERVIEW: Baby-Petite will have a 2-minute chat with each judge in a Round Robin style interview. Baby contestants may have one parent/guardian present during interview. Contestants only in the interview room in all other divisions. Preteen-Elegant will have a 4 minute interview with our panel of judges. Attire may be a dress, suit or pantsuit. Interview will be based on a one-page questionnaire (Baby-Petite divisions see attachment) or a Fact Sheet (Preteen-Elegant divisions). Your questionnaire/fact sheet must be emailed or mailed with your entry form. No fact sheets will be accepted at registration, no exceptions! Photogenic picture is included in this price, it is optional, photos will not be scored, judges mutual pick. Submitted photos should be age appropriate and may be Natural or Re-touched moderately. Pictures may be B&W or color and should be 8x10 in size. Each Additional photo is $5.00 each. COMMUNITY SERVICE: Will be for the Veterans Outreach, each contestant should donate a minimum of $5 to the Veterans outreach. 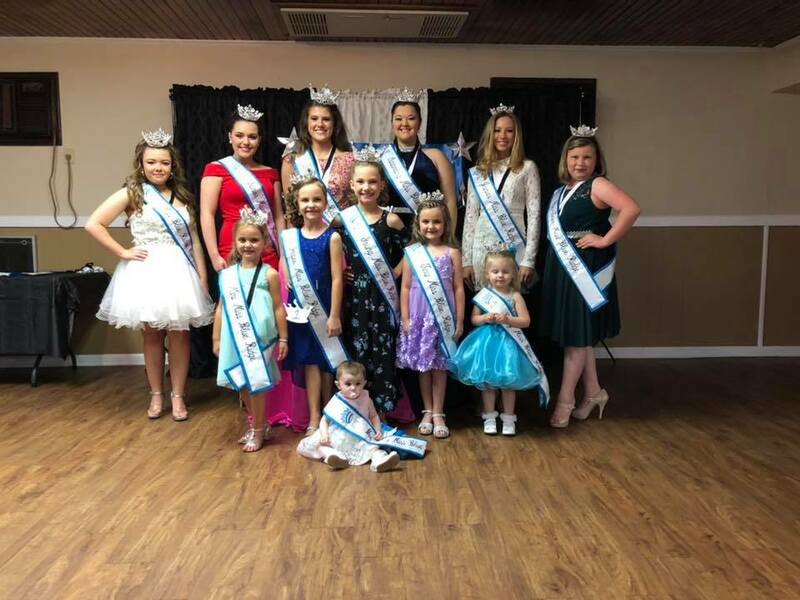 The contestant who collects the most to donate will be named our community service queen and will receive a crown, sash and $50 off in fees to Tiny Miss Eastern America. *For all competition the front T will be used, no pro am routines allowed. No hair pieces or flippers allowed; extensions are allowed as long as they are used for fullness. This is not a glitz pageant. Score Sheets will be available after the pageant. Makeup and hair must be age appropriate. Tammy Samuels (540-652-6213) and Dawn Majors. All Entries must be received by January 23rd 2019…no exceptions. All returned checks subject to return check fee. You can contact Toni Bowyer at 540-908-1813 bowyer0926@msn.com or Michelle Ritter at 540-535-9173 for more information. I RELEASE ALL PAGEANT STAFF, THE LURAY VFW AND ITS EMPLOYEES FROM ANY RESPONSIBILITY OR LIABILITY DUE TO THE LOSS OF PERSONAL PROPERTY, ILLNESS OR ACCIDENT THAT MAY OCCUR GOING TO, AT, OR GOING FROM THE PAGEANT. I AGREE TO SHOW GOOD SPORTSMANSHIP AND UNDERSTAND THAT THE DECISION OF THE JUDGES IS FINAL. NO REFUNDS UNLESS THE PAGEANT IS CANCELLED, IF PAGEANT IS RESCHEDULED, ALL FEES PAID WILL BE TRANSFERRED NOT REFUNDED. NO SHOWS WILL RESULT IN LOSS OF DEPOSIT. I HAVE READ, UNDERSTAND AND AGREE TO THE CONTENTS WITHIN THIS FORM.